University of Washington President Ana Mari Cauce returns $95,000 of her pay back to the university, but some critics say it’s still hard to reconcile her pay with the amount faculty and teaching assistants make. 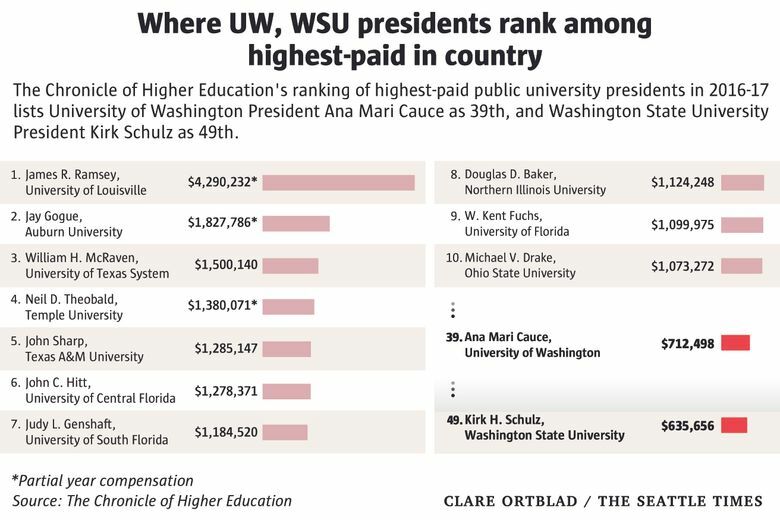 UW President Ana Mari Cauce could be one of the top 25 highest-paid public-university presidents in the nation today. But Cauce, who has been president of the UW since 2015, has struck an unusual arrangement with her employer: She returns all of her deferred compensation — $95,000 a year — back to the UW for programs and scholarships. With that chunk of money going back to the school, Cauce is instead the 39th-highest-paid public-university president in the nation, according to an annual survey by The Chronicle of Higher Education. Her base pay now is $732,792 annually. Still, some critics say they still have a hard time reconciling the size of Cauce’s salary — and the salary of her top administrators — with average pay for professors and teaching assistants at the state’s flagship university. The Chronicle lists Cauce’s salary for 2016-17 as $712,498, a number that doesn’t include the deferred compensation. Since that time, she’s gotten a 2 percent raise, bringing her salary to $732,792. She also receives $55,000 a year in a tax-free retirement account, and a $12,000 car allowance, for a total of $799,792. On paper, excluding the deferred compensation, she’s making less than her predecessors, Michael Young (who left in 2015 to become president of Texas A&M University) and Mark Emmert (who left in 2010 to become president of the NCAA). Young, however, forfeited nearly $1 million in deferred compensation when he left the UW before his contract expired. Cauce is the UW’s first Latina and first lesbian to hold the post, and the first woman appointed to be president in a permanent, rather than interim, position. And she’s generally popular among students, staff and her bosses. It’s “laudable” that Cauce gives so much of her salary back to the university, said Andrea Canini, vice president of one of the university’s major unions, in an email. On the other hand, “the University administration is still providing compensation that puts her near the top of her peer group at a time when the same administration insisted that ASEs (academic student employees) be paid below the median,” Canini said. Academic student employees — the 4,500 teaching assistants, researchers and other graduate students who work for the UW — went on strike for one day this spring, saying that their salaries aren’t keeping up with the cost of living in Seattle and that they’re falling behind their peers in the University of California system. “You have to pay market rate,” he said. “We believe her compensation is in line with the market.” At Cauce’s request, he said, her salary increases are being matched with the same percentage given to UW faculty (2 percent last year, and 2 percent this year). She believes there’s a disconnect between UW administrative salaries overall, which tend to be higher than administrative salaries at peer institutions, and faculty pay, which tends to be lower. For example, professors at the UW make an average salary of $137,925, according to The Chronicle. University professors in the University of California system make anywhere from $192,312 at University of California at Los Angeles, the highest, to $149,103 at University of California at Merced, the lowest. “Austerity reigns everywhere at the UW — faculty are not being replaced, class sizes are larger and larger, TA (teaching assistant) numbers are shrinking,” Cherniavsky said. 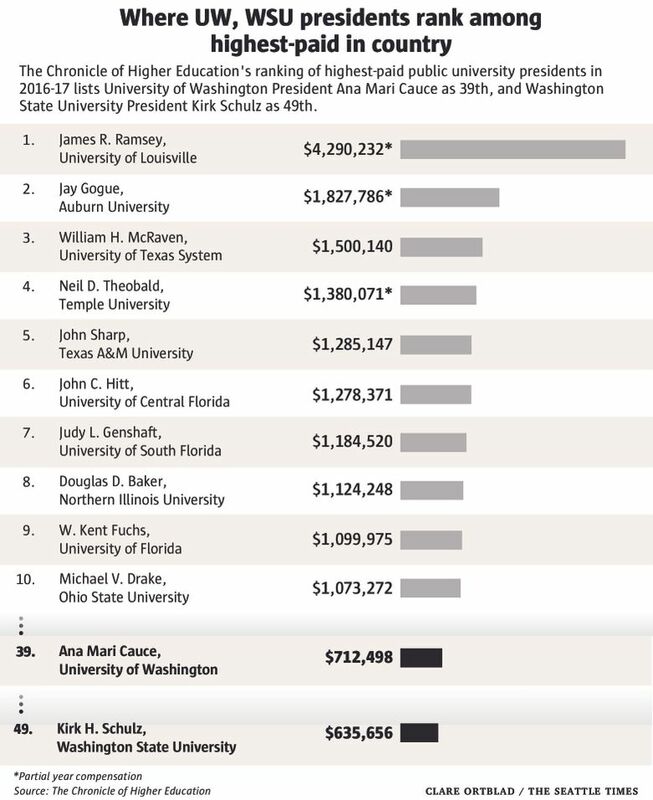 Cauce is the highest-paid university president in Washington — she is also, of course, the president of the state’s largest university. Washington State University President Kirk Schulz, her next closest peer, made $635,656 in fiscal year 2017. This year he’ll make a base salary of $625,000, a $25,000 per year retention incentive that he’ll earn if he stays on at WSU, and other benefits. Both presidents make less than their football coaches. The UW’s Chris Petersen last year signed a new deal that gives him an average of just under $4.9 million per season. WSU’s Mike Leach will make $3.5 million in 2018 as part of a contract extension that will pay him nearly $20 million over five seasons. Clarification: The School of Dentistry’s $42 million debt has accumulated over a number of years. An earlier version of this story suggested the $42 million shortfall was from just this year.